Gethyllis, a genus of the family Amaryllidaceae, has such unusual foliage, flowers and fruits that it ranks as one of the most fascinating groups of bulbous plants in southern Africa. 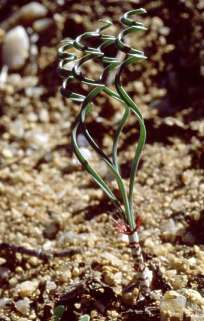 Gethyllis, like most other plants adapted to temperate climates, is deciduous. Nourished by long, fleshy roots, the bulbs store sufficient reserves to survive the long, dry season in a dormant state but when conditions become favourable they produce leaves. Most species have a basal cluster of numerous, narrow, frequently spiralled leaves, whereas a few have only 1 or 2 leaves, which are broad and held flat on the ground. Several species are easily recognized by a prominent sheath that extends above ground and holds the leaves in a tight cluster. The sheaths themselves are often attractively ornamented with handsome reddish brown spots (e.g. G. britteniana) or they are elaborately fringed, as in G. verticillata. 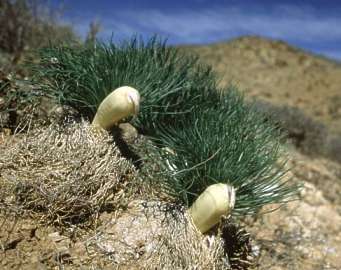 Unlike most Amaryllidaceae, the leaves of Gethyllis are often hairy. The hairs are simple and evenly spaced or T-shaped and clustered together, which adds to the density of the covering. Gethyllis differs from most of its relatives by having just one flower per bulb each season. Each flower has 6 tepals, which join to form a long floral tube that leads down to a subterranean ovary. The flowers vary from white to cream or pink and the tepals are often boldly striped with dark pink. Generally they are sweetly and strongly scented. Equally attractive are the prominent, bright yellow anthers, which help to distinguish groups of species. For instance, G. ciliaris and its relatives may have as many as 30 anthers per flower, whereas G. verticillata and its allies only have 6 anthers per flower as is typical of most Amaryllidaceae. Although initially long and straight, the anthers eventually curl up, becoming less conspicuous with age. The style is noticeably variable in its length and position. It is straight and stout, terminating in a small, undifferentiated stigma, or slender and curved with a conspicuous, broad stigma at its tip. The berry-like, finger-length fruits are borne close to the ground and are variously shaped, coloured and fragrant when ripe. Best known are the fleshy, yellow to pink fruits which smell somewhat of strawberries. Less conspicuous are the slender, thin-textured fruits that remain pale-coloured, sometimes spotted, and odourless. When ripe, the fruit walls disintegrate and release numerous, roundish, cream-coloured to reddish seeds. The basic chromosome number for the genus is x = 6. Although many Gethyllis species are rare, the species listed below are more commonly seen in the wild. Gethyllis has 32 recognized species, 30 of which are found in the summer-arid areas of southern Africa. Only G. transkarooica and G. longistyla are found in the summer-rainfall region's Nama Karoo Biome. The greatest number of species occurs in the Succulent Karoo Biome, followed by the Fynbos Biome. Habitats range from coastal forelands to South Africa's high-lying, inland plateau. In most instances the plants prefer open sites, free of competition from shrubs and grasses. The majority of species favours semi-arid habitats but a few Cape species (G. afra and G. kaapensis) are localized in seasonally moist sites amongst lowland fynbos vegetation. The name Gethyllis is thought to come from the Greek gethyon, which means a bulb, onion or species of leek. 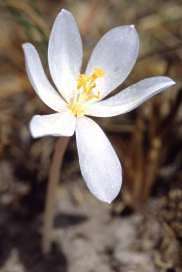 The apparent likeness to a leak is due to the bulbs' long, white sheathing tunics that surround the base of the leaves, rather than to the plants' culinary properties. To cope with their dry environments these plants have developed a remarkably novel lifestyle. They flower fleetingly in midsummer, fruit in autumn, and have leaves in winter, a period when they are most likely to be seen before conditions dry out at the end of spring. Studies suggest that the fleshy seeds evolved early in the group's history and greatly influenced the group's evolution when conditions in southern Africa became more arid several million years ago. The seeds germinate immediately once released, but for the seedlings to survive, they depend on adequate and timely rainfall. In the western and northwestern Cape, the optimal time for seed release is autumn. The large, many-seeded fruits are slow to mature, so flowering is bound to take place several months earlier, in midsummer. To cope with the dry summer conditions, flowering lasts two or three days and is synchronous. In addition, the ovary, which later becomes the fruit, remains cool and protected below ground, where it continues to ripen for several months. The pollination of Gethyllis has not yet been thoroughly researched but the idea that moths pollinate the fragrant flowers seems unlikely as the entrance to the long floral tube is almost completely blocked by the style. The main pollinators are probably bees, drawn to the huge amount of pollen in the large, often multiple anthers. Tortoises, birds and rodents are said to eat the fruit's fleshy pulp and act as agents for seed dispersal but this remains unconfirmed. Instead, the presence of plants in clumps suggests that the seeds drop directly next to the mother plant, allowing the seedlings to remain in habitats that have favoured survival in the past. The significance of the tightly spiralled leaves is not fully understood, but the compact arrangement may prevent water loss, especially when combined with a hairy covering. These features are evident in G. villosa, a widespread species in the semi-arid areas of the western and northwestern Cape. As the bulbs die easily if over-watered, the cultivation of Gethyllis is best left to a bulb specialist and their use in gardens should be avoided. The bulbs grow best in deep containers in a well-drained medium. Water should be applied with restraint in winter but stopped as soon as the leaves begin to wither in spring, when the pots should be moved to a cool, dry place. G. afra L. Plants 100-140 mm high. Leaves 12-30, linear, erect to spreading, spiralled, usually channelled, occasionally with simple, soft spreading hairs on one or both surfaces or the margin. Flower cup-shaped, white with pink reverse, tepals 20-35 mm long, anthers 9-18 in clusters of 6, style straight, as long as the stamens, stigma small. Berry club-shaped, fleshy, yellow to red. Flowering time: December to January. Lowland flats in fynbos from Clanwilliam to Heidelberg. G. ciliaris (Thunb.) Thunb. Plants often forming clumps, 150-300 mm high. Leaves 15-25, narrowly strap-shaped, spiralled, firm, shiny green, the margins fringed with rigid, upturned hairs, the basal sheath 1, mostly subterranean, pale, spotted with maroon when exposed. Flower cup-shaped, ivory to deep pink, waxy, tepals 30-70 mm long, anthers 15-31 in 6 clusters, style straight and stout, stigma narrowly trifid. Berry club-shaped, yellow. Flowering time: December to February. 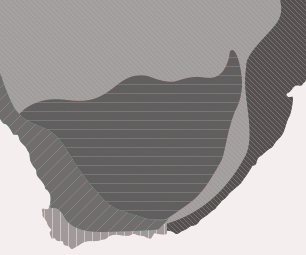 Coastal forelands in deep sand, southern Namaqualand, Nardouwsberg to Cape Peninsula. G. villosa (Thunb.) Thunb. Plants 30-150 mm high, sometimes clumped. Leaves 4-12, narrow and tapering to each end, spreading, loosely spiralled towards the apex, more or less covered with soft, white, T-shaped hairs, the margin and apex often with dense, firm, compound hairs. Flower white or pink, tepals 20-40 mm long, anthers 6, style longer than the stamens, curved sideways, stigma broadly 3-lobed. Berry slender, cylindrical, membranous, white with red seeds. Flowering time: October to December. In sand or clay on flats or south-facing slopes, Namaqualand to Mossel Bay and western Karoo. Du Plessis, N. & Duncan, G. 1989. Bulbous plants of southern Africa. Tafelberg, Cape Town. Jackson, W.P.U. 1987. Origins and meanings of names of South African plant genera. Botanical Society of South Africa, Kirstenbosch, Cape Town. Manning, J., Goldblatt, P. & Snijman, D. 2002. The color encyclopedia of Cape bulbs. Timber Press, Portland, Cambridge. Smith, C.A. 1966. Common names of South African plants. Memoirs of the Botanical Survey of South Africa No. 35. Department of Agricultural Technical Services, Pretoria. Watt, J.M. & Breyer-Brandwijk, M.G. 1962. The medicinal and poisonous plants of southern Africa and eastern Africa. Livingstone, Edinburgh and London.